To celebrate 500 followers (seriously, you guys rock!!) Here is a fun freebie to spruce up your writing centers!! 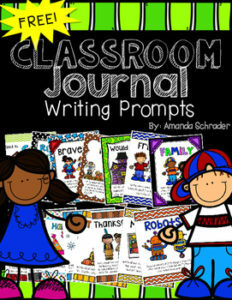 It includes 30 writing prompt/classroom book covers. Here’s how I use them (feel free to use anyway you’d like). Print them out (and laminate for durability). Then I run the writing paper back to back, this offers pages with a front and back. Then each student in the class makes a page responding to the prompt. After they are done, I bind each student’s page using the prompt as the cover. Now you have a classroom book! I put them in our classroom library, and do a drawing for them at the end of the year. I hope you enjoy!! Want to show your appreciation? Leave some feedback! Check out my word work pack! Looking for a great resource to teach the parts of speech? Tag Titles: FREEBIE, free, writing prompt, classroom journals, writing, writing center ideas, and yearlong bundle.